Welcome Home to The Ultimate Upper Mission "Quarry" walkout rancher home! 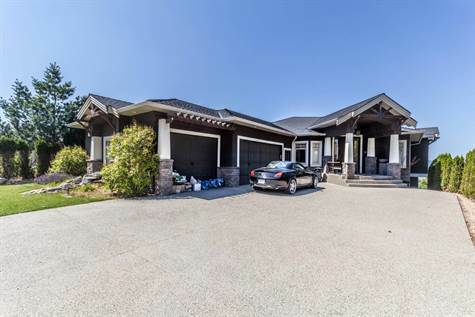 With over 5400 square feet of highly functional living space with 5 bedrooms and 5 bathrooms this home is perfectly laid out for every lifestyle. This home offers full lake & city views, barrel vaulted ceilings, granite on every countertop, intricate accent lighting in ceiling, extensive hardwood & tile, large covered deck, lavish master suite w/double granite vanities, glass surround shower, jetted soaker tub, heated floors and fireplace. Large walkout basement w/media room, games room. 3 other bedrooms have bathrooms attached. Over $125K in landscaping upgrades including Syn Lawn (high end turf), putting green and 2 water features. Triple car garage with lots of driveway space. Full Sound/Intercom system, Security System, 4 fireplaces. This home has it all. 2016-Present GRAND-CENTURION® Team Award Recipient.